For healthy and beautiful hair with renewed bursts of fragrance! 1. Specially formulated to lift away grease and residues. 2. Breakthrough Fragrance Release Pearls Technology gives burst after burst of fragrance at every touch that lasts up to 48 hours! The heavenly fig is a natural ingredient containing powerful antioxidants. Fragrance Release Pearls release renewed bursts of fragrance at every touch, so you have your hair always on your side. Dedicated for hijab hair. Its special formulation lifts away grease and residues. Fragrance Release Pearls Technology gives you burst after burst of fragrance at every touch that lasts up to 48 hours too! Ready? Pour into your hand, apply evenly over your hair, massage gently, and then rinse thoroughly. 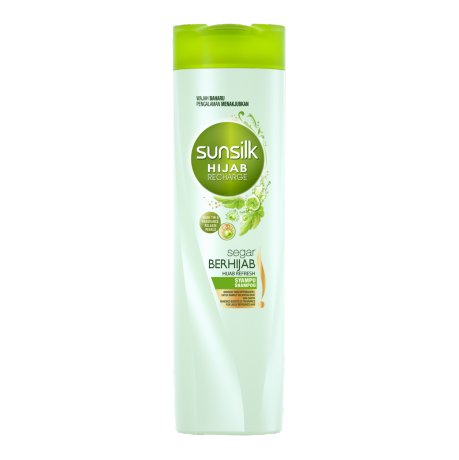 For even more incredible hair, why not combine it with SUNSILK HIJAB RECHARGE Segar Berhijab conditioner.